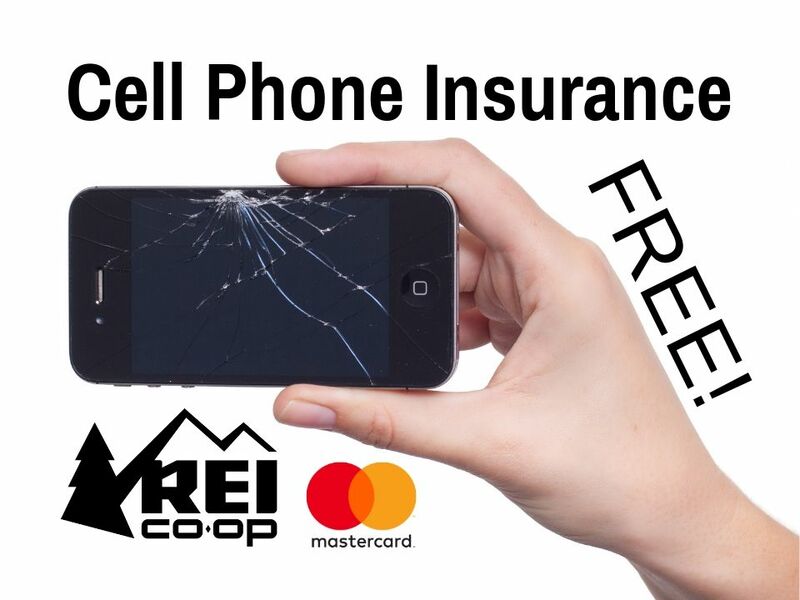 As an REI Co-op Mastercard card holder, you get free cell phone insurance. Yes, that’s right, FREE. You will be reimbursed for damage or theft of your cell phone when you pay your monthly cellphone bill with your REI credit card. There’s no signing up and no fees. To enroll, all you have to do is use your REI Mastercard to pay your monthly wireless cell phone bill. The REI Mastercard has no annual fee, so that means that the cell phone insurance is completely and 100% free. Wether you use your REI Mastercard for everyday purchases or not, it’s a no-brainer to start paying your monthly cell phone bill with your REI Mastercard in order to get the free cell phone insurance. REI added cell phone insurance protection to the REI Mastercard in late 2018. Prior to this, I only used my card to earn 5% back on REI purchases. Now that the REI Mastercard has cell phone insurance, I pay my cell phone bill with it every month. According to the REI Mastercard website, damage and theft is covered by the cell phone protection insurance. Damage or theft of your eligible cellphone, up to $600 per claim, with a $50 deductible, up to ($1,000) per 12-month period. Below are examples of types of cell phone damage that are covered by the REI Mastercard cell phone insurance program. I have a OnePlus 5T smartphone which I bought for $500. If I drop my phone in the pool or put it through the washing machine, all I have to do is file a claim, pay a $50 deductible, and Mastercard will sent me a check for $500. If you have an iPhone worth $900, you’ll pay the deductible, but Mastercard will only send you a check for $600 because that’s the limit per claim. In the case of theft, the same $50 deductible and maximum of $600 per claim applies. Additionally, a police report must be filed within 48 hours of the incident. It doesn’t seem like a mysterious disappearance will be covered unless there is a police report. Cellphones stolen from baggage are not covered unless hand-carried or under supervision by the owner or someone the owner knows. Not sure why, but cellphones stolen from a construction site are not covered either. I’ve owned six or so cell phones, and probably cracked screens on half of these phones. A cracked cell phone screen is covered by REI Mastercard cell phone insurance protection. For claims involving damage of the cellphone, a repair estimate will be required. Cosmetic damage or damage that does not impact the ability to make or receive phone calls is not covered by the cell phone insurance. Other types of cell phone damage that are not listed above are covered by the REI Mastercard cell phone insurance. That is, of course, according to the terms of the program and as long as it is accidental and not intentional. I feel it necessary to point out that not everything is covered. The following is not covered: damage or theft resulting from abuse, intentional acts, fraud, hostilities of any kind (including, but not limited to, war, invasion, rebellion or insurrection), confiscation by the authorities, risks of contraband, illegal activities, normal wear and tear, flood, earthquake, radioactive contamination, or damage from inherent product defects or vermin. What About Cell Phone Family Plans? Cell phone protection with the REI Mastercard applies to up to three cell phones—the primary line and up to the first two secondary lines. All cell phones must be on the same phone bill that is paid with your REI Mastercard. Cell phone accident coverage is available to REI Mastercard card holders through the Mastercard Cellular Wireless Telephone Protection Program. All this means is that REI is not the one providing the insurance, but rather Mastercard. When the time comes necessary, you can file a claim at http://mycardbenefits.com. Although I haven’t made a claim yet, it’s only a matter of time until one of my family members or I drop, crack, or have one of our cell phones stolen. Cell phones cost anywhere from $300 to $1,000 nowadays. With free cell phone insurance through the REI Mastercard, we don’t have to worry about any of these accidents costing us hundreds of dollars anymore, and neither do you.